Ladybank – The Fife Post………..for genealogy and historical information. Ladybank became a Police Burgh in 1877. The Burgh has not recorded arms; its seal bears a device showing a decorative capital letter ” L “, with a mural crown above. The webmaster of Heraldry of the World contacted me and kindly offered me a passage from the book The arms of the baronial and policeburghs of Scotland by John Marquess of Bute, J.H. Stevenson and H.W. Lonsdale. 1903. It lists which was a possible proposed arms for the burgh. (shown on the left) with the following words. The seal is party per pale, having on the dexter side a nun holding a large open document in both hands, and on the sinister a monk vested in an alb, chasuble, and amice, having a book in his left hand and in his right a pastoral staff turned outwards. 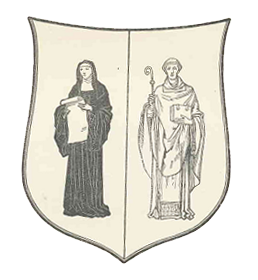 The town clerk is good enough to write to us: “ The seal represents on the right a monk and on the left a nun, As I was not clerk of the burgh when the design was chosen, I cannot give the exact reasons which led to its selection, but I have gathered that the following are the main considerations: The area on which the town stands was originally called Monksmoss, and this was granted by the Earl de Winton to the monks of St Mary’s at Lindores (Sibbald’s History of Fife and Kinross,” ed.1803,p.385). Until the beginning of the present century it appears that the then existing hamlet was named Monkstown, and the lands surrounding it Ladybog. Shortly thereafter the village extended eastward and was named Ladybank, but the western part is still known as Monkstown. The monk on the seal, therefore, derives its meaning from the fact of the place having at one time been in possession of the monks of Lindores. The meaning of the nun is, however, more obscure, and I cannot authenticate the story on which Commissioners relied when choosing the arms. There is a legend that the Lindores monks built a house in the midst of Monksmoss, and it was their custom to incarcerate there the nuns at the Lindores nunnery who had disobeyed the rules of their order, and thus the place derived the name of Ladybog, subsequently Ladybank. This, as far as I know, is the only explanation of the nun on the burgh seal.” The latter story is absolute nonsense. There were no nuns at Lindores.